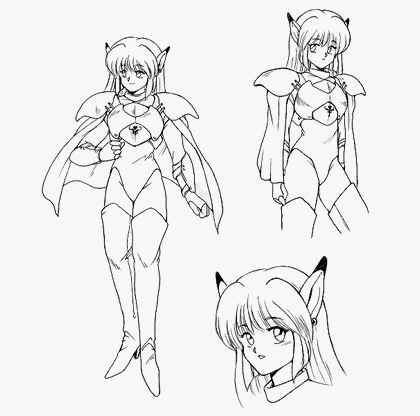 These character designs for Phantasy Star IV show us a pair of common poses for Rika. The full body sketch was used in the game manuals and various promotional material. The other pose gives us a glimpse at a slightly more relaxed Rika. The draping of her cape over her arms gives the impression of a more subdued state than her typically abundant enthusiasm, creating an unusual piece for the character. The headshot included provides a glimpse at a curious, or perhaps welcoming, expression.